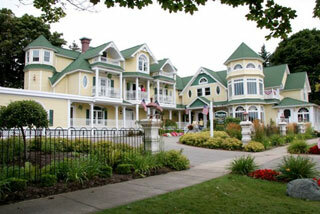 Brigadoon offers the ultimate in "Old World Charm" with all the modern conveniences of today. Brigadoon proudly boasts beautifully decorated guest rooms - all with lovely private baths with heated marble floors, king-sized canopy beds, in-room fireplaces, private balcony, a delicious seated breakfast, whirlpool tubs, free wireless internet, wet bars with refrigerator & microwave, freshly baked cookies every afternoon, and a specially prepared dessert served each evening. Cloghaun is one of the oldest Victorian homes on the Island. Thomas and Bridget Donnelly left Ireland in 1848, and completed Cloghaun in 1884. This lovely home has been preserved by their descendants and now offers guests a tranquil, romantic interlude from the demands of everyday life. Eleven guest rooms individually designed and decorated with antiques from the late 1800’s evoke a feeling of casual elegance. Cloghaun is located on Market Street, one block from the harbor and close to many fine restaurants, shops and riding stables. All boat docks are within easy walking distance. Located on the beach of Lake Huron between Tawas and Oscoda, the Huron House is an award-winning 14 room luxury Bed and Breakfast lakefront destination. Perfect for a romantic getaway, couples enjoy the beautiful Lake Huron views, hearing the lapping waves from their rooms, and walking on the soft sandy beach. 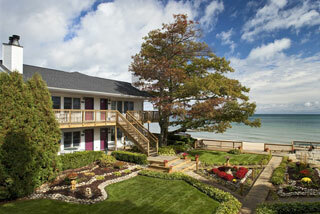 Awake to the breathtaking sight of the sunrise of Lake Huron before enjoying a sumptuous breakfast. King beds, breakfast delivered to the rooms, private decks, fireplaces, personal hot tubs and Jacuzzi tubs are some of the relaxing amenities that guests at the Huron House enjoy. 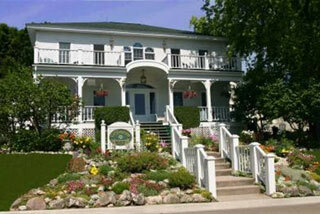 The Metivier Inn is a lovely boutique bed and breakfast on Mackinac Island, Michigan. The Inn was originally built as a private residence in 1877 and has been operated as a bed and breakfast for over 25 years. Conveniently located on Market Street in the downtown historic district. Features include: A delicious HOT breakfast buffet and complimentary afternoon coffee and sweets; Magnificent French country gardens; Individually decorated rooms with private baths and air conditioning; Spacious front and side porches; Wireless internet access; Flat screen TVs in all rooms. 565 W. West Branch Rd.